In February last year I took a trip to Gainesville, Florida to take a course related to my day job. It was evident from our first breakfast together that participants had come from all around, and I eventually met people from Canada, Nebraska, New York, India, Florida, and all points in between. It was also at that first breakfast that I met the BFFFF’s. As soon as I heard these two gentlemen rounding the corner in the hotel lobby, I knew they were my kind of folks. Amongst all the other accents floating around in the room that morning, theirs was one I could relate to. I soon learned that they were from Alabama – Florence in particular – not far from the little North Mississippi town where my mother grew up. So it was that in Gainesville, Florida, my friendship with Both Fine Fellows From Florence began. I assured them I would bring my list of “100 Dishes to Eat in Alabama Before You Die” – I’ve even got the app on my phone now – but also asserted that I trusted them to take me someplace unique and local that may not have made the list. I arrived in mid-morning, we talked shop for a little while, then the lunch discussion began. They didn’t have to twist my arm very much to get me to agree to barbecue. But because we had much to cover and not much time, they sent someone to Bunyan’s Bar-B-Q to fetch our lunch. The order was simple – three barbecue sandwiches and three hot dogs. Hot dogs? Yep. Then they asked about drinks. Because I like to properly pair drinks with my meals, I said, “If we’re going to have barbecue, we need sweet tea.” I think I heard an amen. BFFFF The Younger asked if Milo’s was okay, and of course it was, so he hollered (politely), “Bring some Milo’s Sweet Tea – and not the fake sweet, the real stuff – the red top, not the yellow top.” I told you these guys were alright. The food arrived just the way it should have – each sandwich wrapped tightly in wax paper, softened just a bit by sauce and steam. I tackled the pulled pork sandwich first. It was not soaked in barbecue sauce (thank the good Lord), but was instead slathered with a vinegary orangish-colored slaw that reminded me just a little of the red slaw native to some parts of North Carolina. In the opinion of BFFFF the Younger, the slaw was the thing that made the sandwich. I would be hard pressed to disagree. 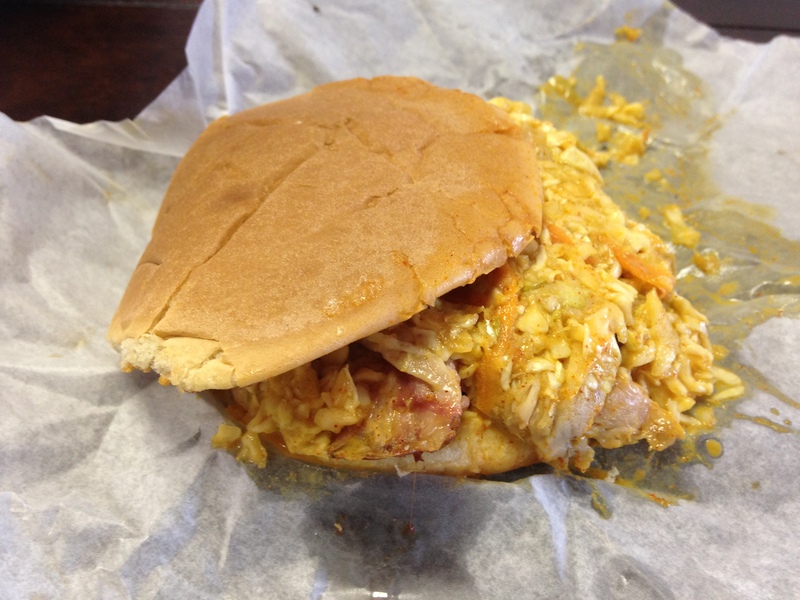 In earlier days, before my palate was reformed, I would decline the opportunity to get slaw on my barbecue sandwiches, but that was mostly because I just didn’t like slaw at all. Now I love slaw of all kinds, and even on a pulled pork plate I encourage mingling. After lunch we hammered out some more real work, then got down to my list. Most of the dishes listed in Florence were a little bit out of reach for that time of day: Bread, herbs and olive oil at Ricatoni’s and Crab Cakes at the Marriott Hotel and Spa. It was Wednesday at 3 pm, so Sunday Brunch at The Sweet Magnolia Café was out. Dale’s Steakhouse (of Dale’s seasoning fame) had changed hands. But there was one I knew we could handle. 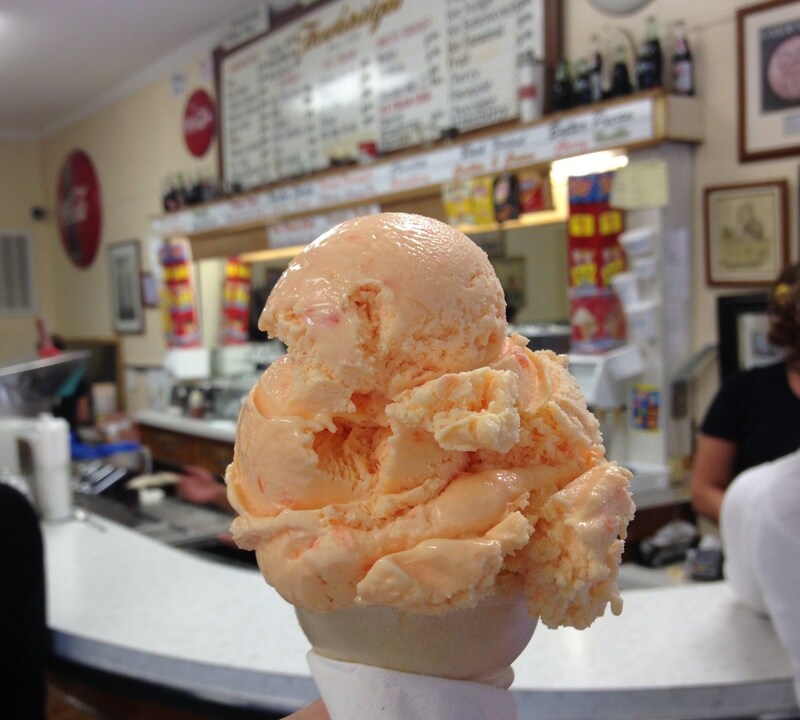 Orange-Pineapple ice cream at Trowbridge’s. Since the day began with barbecue and ice cream, I decided I might as well stick to that pattern on the trip home. 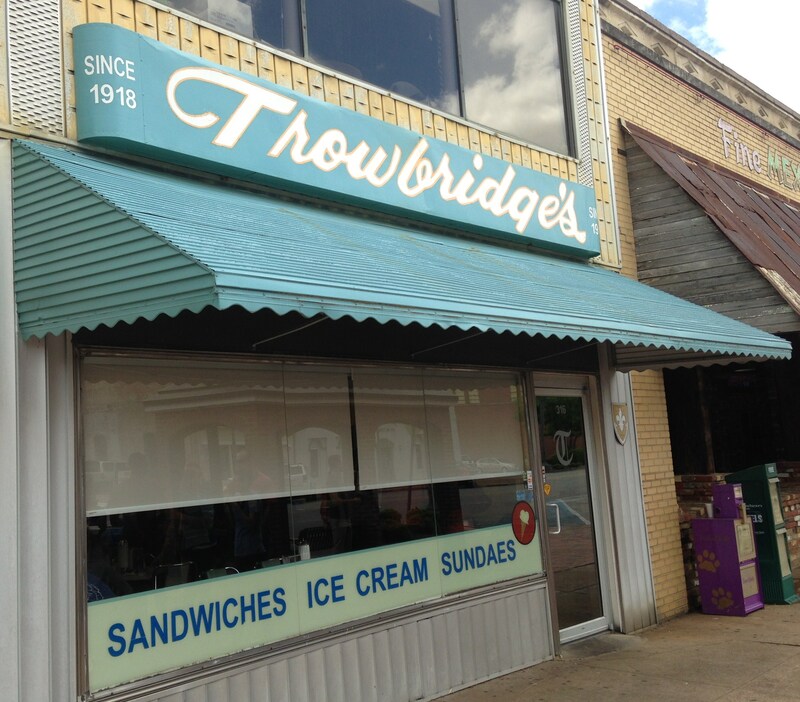 I stopped in three different cities, searching for a milkshake, banana pudding, caramel cake and more barbecue. Instead I found each place on my list dark and locked. Closed, closed and closed. Thankfully I had a granola bar leftover from breakfast. I definitely need to go back to see the BFFFF’s, but next time I will make my stops on the way.